A Diamond Select Toys release! Spider-Man's ultimate foe gets the ultimate statue! 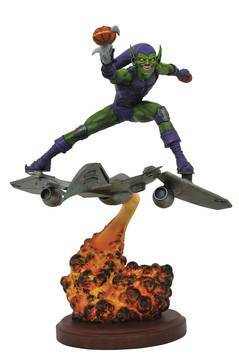 The Green Goblin stands on his Goblin Glider and throws a smoking pumpkin bomb in this approximately 1/6 scale sculpture. Hand-sculpted by Clayburn Moore based on a design by Yuri Tming, this resin statue is limited to only 3,000 pieces, and each comes with a certificate of authenticity in a full-color box..